Compression is the process of reducing the dynamic range between the loudest and quietest parts of an audio signal. This is done by boosting the quieter signals and attenuating the louder signals. Compression is mainly used on vocals, however can and should be used across the board of mixes, to ensure full control of the final mix. Compression should be enough to control the mix, and whenever using the effect it should not be obtrusive – this is all how your own ears perceive the sounds however. Threshold – How loud the signal is before compression is applied. Release – how quickly after the signal drops below the threshold the compressor stops. Knee – sets how the compressor reacts to signals once the threshold is passed. Hard Knee settings mean it clamps the signal straight away, and Soft Knee means the compression kicks in more gently as the signal goes further past the threshold. Make-Up Gain – allows you to boost the compressed signal, as compression often reduces the signal significantly. Output – allows you to boost or decrease the level of the signal output from the compressor. No. 10: Compression is part of the sound of contemporary music. Completely uncompressed music would sound lifeless and boring to most listeners. They crave more energy than unprocessed sound offers. No. 9: Louder music, even if it’s just slightly louder, almost always sounds better than quieter music. No. 8: Most music is listened to in the background to accompany some other activity like working, reading exercising, driving, or cooking. When you’re doing something else, uncompressed music’s constantly shifting volume level would be an annoyance. No. 7: When listening in shuffle mode, there’s a good chance you’ll skip over the quieter songs to get to the next tune. Record producers live in fear of a mix that’s too quiet. No. 6: In the days before CD mastering, engineers needed to boost the quietest sounds to keep them above the LP’s noise floor, and reduce the loudest sounds volume level to keep the “needle” in the groove. Digital didn’t have those problems, but we still wound up with CDs that have less soft-to-loud dynamic range than LPs. No. 5: Engineers like using different types of compression to create new sounds to catch the ear. There’s nothing wrong with that. No. 4: People so rarely listen to music in quiet surroundings, they need compression to keep music loud enough to be heard over the noise. No. 3: If people really didn’t like compression, they would stop buying/listening to compressed music (see No. 1). No. 2: People mistake compression for dynamics; when all the sounds are loud and “punchy,” it’s called “dynamic.” Naturally dynamic music lacks the kick of a compressed mix. No. 1: Audiophiles like to complain about compressed music, but they actually prefer it. Multi-band Compression – Compressor that allows you to change the frequency bands, ensuring you can change the compression levels of certain frequency bands rather than the full bandwidth. 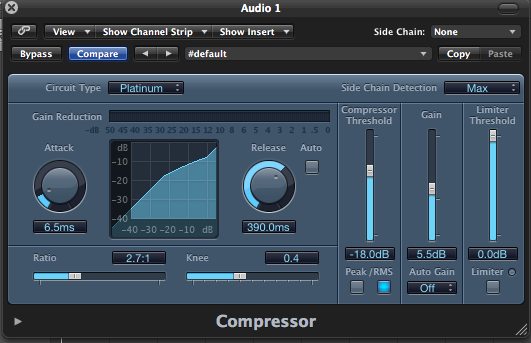 Multi-band compression is good for mastering. 1930s-40s – Compression created to control volume of TV/Radio presenters whispering/talking quietly as-well as an entire audience clapping. The first compressors just had In/Out functions and no other controls. 1937 – ‘The Western Electric 110 limiting amplifier created, being considered to be the first commercially available compressor. 1980s – DAWs included Compression as standard in their software, rather than needing Compression Racks.